A business is partially exempt if it makes, or intends to make, both taxable and exempt supplies and incurs tax on costs that relate to both. If your business is partially exempt, then you may not be able to recover all your Input VAT. To adjust your VAT return to reduce the amount of Input VAT that can be reclaimed you can post a Cashbook Payment. 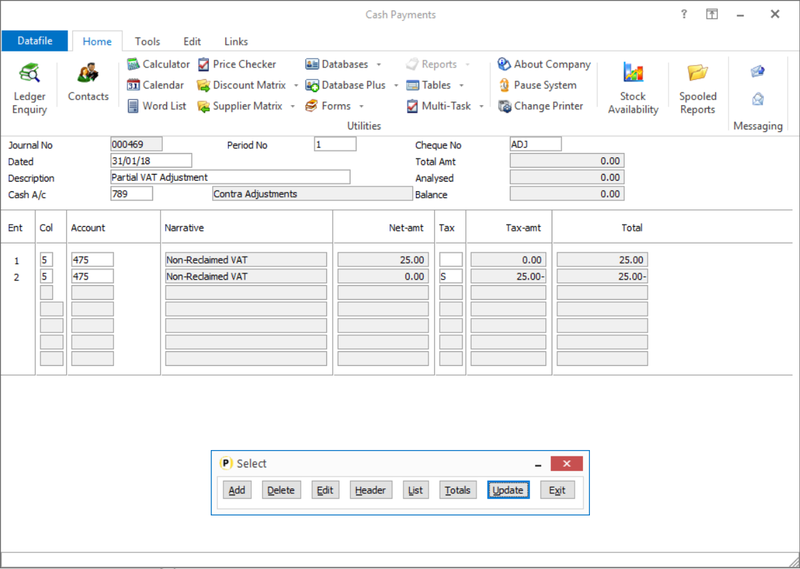 As per the screenshot above, post the Cashbook Payment using your Contra Adjustments account and set the total payment value as 0. For line 1 select your Non-Reclaimable VAT expense account and enter the net amount as the amount of VAT that cannot be reclaimed, leave the VAT code and VAT amount blank. For line 2 select your Non-Reclaimable VAT expense account again, leave the net amount as zero, enter your standard rate VAT code, and enter the VAT that cannot be reclaimed as a negative value. Posted - Thu, Oct 11, 2018 at 9:13 AM This article has been viewed 187 times.